One of the most distinguished scientific discoverers and physicists of his time, Oersted was born in 1777 at Rudkjobing, on the Danish island of Langeland, where his father practiced as an apothecary. 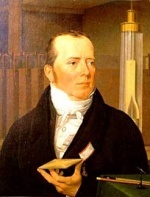 In 1794, he entered the University of Copenhagen, where he took the degree of doctor of philosophy in 1799, and soon afterwards became assistant to the professor of medicine, in which capacity he gave lectures on chemistry and natural philosophy. In 1806, after having enjoyed a traveling scholarship for several years, and visited Holland, the greater part of Germany, and Paris, he was appointed extraordinary professor of natural philosophy in the University of Copenhagen. In 1812 he again visited Germany and France, after having published a manual under the title of Videnskaben our Naturen's Almindelige Love, and Förste Indledning til den Almindelige Naturloere (1811). During his residence at Berlin, he wrote his famous essay on the identity of chemical and electrical forces, in which he first developed the ideas on which were based his great discovery of the intimate connection existing between magnetism and electricity and galvanism -- a treatise which, during his residence in Paris, he translated into French, in conjuction with Marcel de Serres. In 1819, he made known these important truths in a Latin essay, entitled Experimenta circa Efficaciam Conflictus Electrici in acum Magneticam, which he addressed to all the scientific societies and the leading savans of Europe and America, and thus made good his claim to be regarded as the originator of the new science of electromagnetism. This discovery, which formed one of the most important eras in the history of of physical science, obtained for Oersted the Copley Medal from the Royal Society of England, and the principal mathematical prize in the gift of the Institute of Paris. The original and leading idea of this great discovery had been in his mind since 1800, when the discovery of the galvanic battery by Alessandro Volta had first led him to enter upon a course of experiments on the production of galvanic electricity. The enunciation of his theory of electromagnetism was followed by many important experiments in regard to the compression of water, and by numerous other chemical discoveries, among which we may instance his demonstration of the existence of the metal aluminum in alumina. The influence which Oersted exerted on the science of the day by his discoveries, was recognized by the learned in every country, and honors increased upon him with increasing years. He was corresponding member of the French Institute, perpetual secretary to the Royal Society of Sciences in Copenhagen, a knight of the Prussian Order of Merit, of the French Legion of Honor, and the Danish Order of the Dannebrog, and a councillor of state. Oersted's great object through life was to make science popular among all classes, in furtherance of which he wrote numerous works, contributed scientific papers to the newspapers and magazines of his own country and Germany, and in addition to his regular prelections in the university, gave courses of popular scientific lectures to the public, including ladies. Among the works specially written to promote the diffusion of scientific knowledge, those best known are Aanden i Naturen (Copenhagen, 1845), and Natur-loeren's Mechanische Deel (Copenhagen, 1847), both of which were translated into several other European languages. The majority of his more important physical and chemical papers are contained in Poggendorff's Annalen, and were written by him in German or French, both of which he wrote with the same faculty as his own language. At the close of 1850, a national jubilee was held in honor of the 50th anniversary of his connection with the University of Copenhagen -- a festival which he did not long survive, as his death occurred at Copenhagen on 9th March 1851. A public funeral, attended by all persons distinguished by rank or learning in the Danish capital, bore testimony to the respect and esteem with which he was regarded by his fellow citizens, among whom his memory is cherished, not merely as one of the greatest scientific benefactors of his times, but as a man who contributed largely, by his eloquent and earnest advocacy of liberal principles, to the attainment of the high degree of constitutional freedom which Denmark now enjoys.